I think wedding parades are such a fun idea. And this one took place on bikes no less! "It only took 34 years, but it was nice to finally see a wedding done right: carefree, personal, hilarious, and full-up with love." What will your wedding guests say about your wedding? I hope that they say its the most fun they have had at a wedding! Unfortunately, I'm afraid most of our guests will be saying, "why was there no mention of God in their ceremony?" That's just not how the FH and I roll. Oh well. 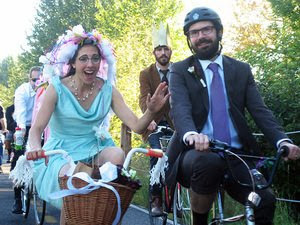 I really wanted to have a 'bike brigade' to our wedding too. everyone! park your cars for the weekend, rent bikes, the town is small, and we all ride to our wedding. many nixed that right away. ride in a dress!? ride in heels!? i'm not going to want to get sweaty! oh the travesty...a little fun at a wedding. ah well...i'm glad you're doing it! I don't want to stress about what people are going to say about my wedding. Don't I have enough to worry about without seeing such backhanded compliments as "it only took 34 years" (to see a wedding done right) or to read questions that almost sound threatening -- are you going to do the right thing by your wedding guests? Whether it's standard wedding blogs that seem dogmatic about following currently acceptable trends and color combinations, or alternative wedding blogs that react vitriollically against anything that smacks of the standard wedding blogs, or the various offshoots (keep it real wedding blogs, budget wedding blogs, etc) that so often sound smugly superior about having the type of wedding they would approve -- the thing I can't believe about this wedding blog world is that people can be so negative about something that is profoundly important to another person! You don't hear people saying "that baby is ugly" or "that funeral was cliche". Why the need to criticize and stand in judgment over others' weddings? I have put so much thought and care into my guests and the hope that my wedding day will be a wonderfully fun, memorable, romantic, and joy-filled event. The last thing I'd like to hear is that one of my guests five years later tells somebody "hey, i finally attended a wedding that was done 'right'" (of course complimenting the wedding that was done right for him but dismissing all previous weddings he'd been invited to. invited to share in their most joyous occasion. and I guess take notes to compare it to other events.) Or that another guest thinks our wedding vows were too cliche. Or that another thinks my colors were too "dramatic". Or that another thinks I spent too much money while her table mate thinks everything looks too DIY and cheap. Of course we all love to read these blogs because there are so many beautiful and fun ideas and we want to make the day special in the way that makes sense for us. But I really really wish that people maintained respect and awe for the wedding day without setting up challenges for the couple to do it right. Now you see? I hate that I've turned negative myself and I hope to purge myself of this completely by my wedding day. I realize that the idea here is to plan backwards and then design your wedding from there. But there will be problems, I will make poor decisions, I will change my mind after the fact about the table settings, I will regret not doing something or saying something, etc. I don't want the bar to be set so high for perfection -- whether perfection means style, social correctness, individuality, or any number of things -- that neither I nor anybody else could ever attain it.